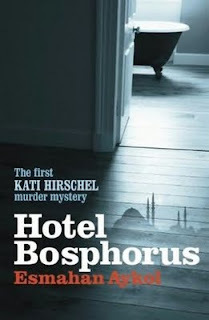 Billed as the "first kati Hirschel murder mystery," Hotel Bosphorus by Esmahan Aykol (recently published in a translation by Ruth Whitehouse, for Bitter Lemon Press) starts from a comic and cozy premise: like Colin Bateman's "mystery man," Kati runs a crime fiction bookshop (in Istanbul), and as with Bateman's books, the tone is frequently comic (not quite as broadly as Bateman's, though). Kati is a German who was born in Turkey and has returned to Istanbul, running through several jobs before opening her bookshop. One of the interesting and amusing things about the story is this reversal, a German immigrant in Turkey, and the culture clash of her situation is a frequent subject of both plot and comedy. A childhood friend who is now a minor film actor arrives in Istanbul to make a movie, and calls on Kati. The reunion takes a sinister turn when the film's director is murdered in his hotel. The novel seems to be taking a well-trodden cozy-ish path when Kati turns amateur detective and makes a professional and personal connection with a handsome Turkish detective. For a good part of the story, her attraction to the detective and her reluctance to follow through with her desire for him are accompanied by the very slowly moving investigation into the crime (by both parties to the not-quite-consummated affair). After that had gone on for a while with no advance in the story, I was beginning to lose interest in the story. But there is a sudden turn, when Kati's mother (in Berlin) is hospitalized and Kati feels an urgent need to be by her side. There are a couple of ensuing coincidences that strain credulity a bit, but twist the story in a much more interesting direction (and even the trip to Berlin is interesting, in advancing the culture-clash aspect of the tale). I won't say anything more about that twist, but it takes the story out of the conventional cozy and into much more interesting territory, right through to the conclusion. The tone is light, throughout, and the violence is off-stage. 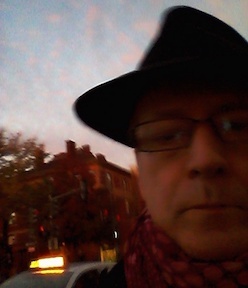 So even if the books isn't quite a cozy, it's not as dark as the contemporary noir genre can be. 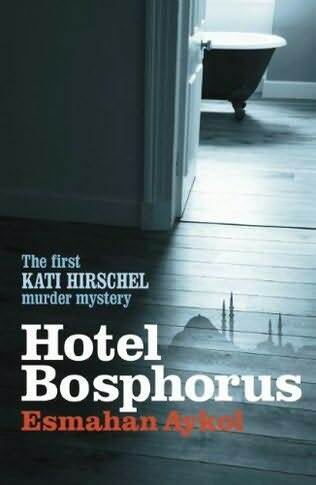 I'm interested to see where Aykol takes the series: it could go in either direction, light or dark, or could perhaps maintain the delicate balance that kept Hotel Bosphorus interesting for me. I'm hoping that Bitter Lemon will continue to translate and publish Aykol's work, which is at the very least quite different from the other Turkish crime fiction (but Turks and foreigners) that we have had access to in English up to now. The cover image, by the way, is related to the crime and is quite atmospheric, but doesn't give much of the flavor of the book--it suggests a much more relevant cover for one of Sophie Hannah's books. Still, it's an attractive cover and does set up one scene that is referred to but never actually experienced by Kati herself (a frequent problem for amateur detectives, who don't have the access of a professional detective to all aspects of a crime). Excellent review, as ever, Glenn. I had been put off this by lukewarm to negative UK reviews when it came out there earlier this year, but maybe I will give it a go as the Turkey setting appeals.